Anyone who's ever seen Rupeni Caucaunibuca play will know that on form, and when fit, he's probably the most explosive winger we've seen in a long time. He was with Auckland a cpl of years back in the Super 12. Since then, he's wandered around clubs in France and has been a regular no shower at important matches. He's done it once again. The Fijian wingers future at the club is in doubt, with club officials seeking clarification regarding his commitment to the club. Anyone who has more clips of this guy plz let me know. Update: As Jeff has so kindly & politely pointed out in the comments section, Caucaunibuca has been playing in France for Agen and doing pretty well apparently. Still would love to see him in the Super 14.
bloody hell. Your behind the times. 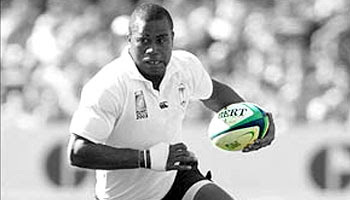 He plays for agen now. He is the leading try scorer 2 seasons in a row and has just been named france most valuable player. Ive heard depite his weight he clocked an impressive 10.66 for the 100m on grass in football boots. isnt he playing for toulon? I was in fiji in 1st week of june 08 met some of his village tribes on my way to a small town on fiji's second largest island-vanua levu on the province of Bua. They told me his on vacation and also getting herbal medicine treatment for an old rugby injury thats been bothering him sometime now, also has trimmed down and very very fit doing alot of training in the jungle nearby his village. Hopefully best of luck to him hoping to see him again the rugby arena.